Whole, organic ingredients. Good nutrition. Wow, carrot cake in the woods! Just like eating a slice of Great Aunt Edna's award-winning carrot cake. 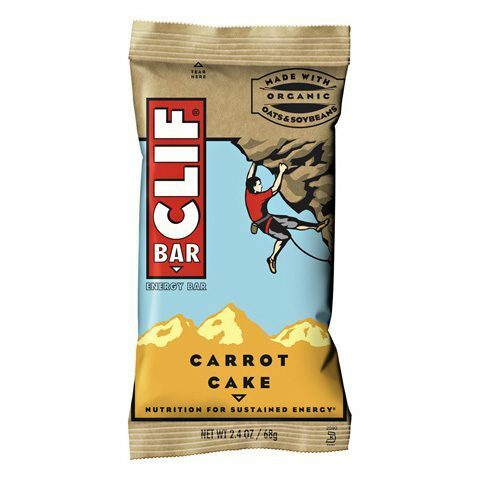 1 bar is a nice 240 calorie snack. Organic brown rice syrup, clifpro® (soy rice crisps [soy protein isolate, rice flour, barley malt extract], organic roasted soybeans, organic soy flour), organic rolled oats, organic evaporated cane juice, organic dried apples, soy white chocolate (organic evaporated cane juice, cocoa butter, soy flour, soy lecithin, natural flavors), clifcrunch® (apple fiber, organic oat fiber, organic milled flaxseed, inulin [chicory extract], psyllium), organic soy butter, dried carrots, raisins, coconut, sea salt, natural flavors, nutmeg, cinnamon, cloves. Nutrition facts here & on wrapper may differ due to ingredient updates. Info on wrapper reflects actual contents.